Joining Catholic schools across the nation, the Mater Dei community celebrated Catholic Schools Week January 27 through February 2. This year’s theme was “Catholic Schools: Learn. Serve. Lead. Succeed.” During this special week, which was filled with a variety of activities, we celebrated all members of our Mater Dei Catholic High School community who remain dedicated to ensuring that we continue to serve as a community in which students may learn, serve, lead, and succeed! We are also proud to announce that during our Catholic Schools Week Bucks for Bowling charity challenge, the Mater Dei community raised an amazing total of $3,150 for Rally for Rae! The freshman class, the challenge champions, will enjoy crazy bowling in the near future. We thank the members of the Mater Dei community for the generosity and continued prayers for RaeAnne Toennies and her family. To begin the celebration of Catholic Schools Week, students offered words of gratitude to the many parishes who support Mater Dei. 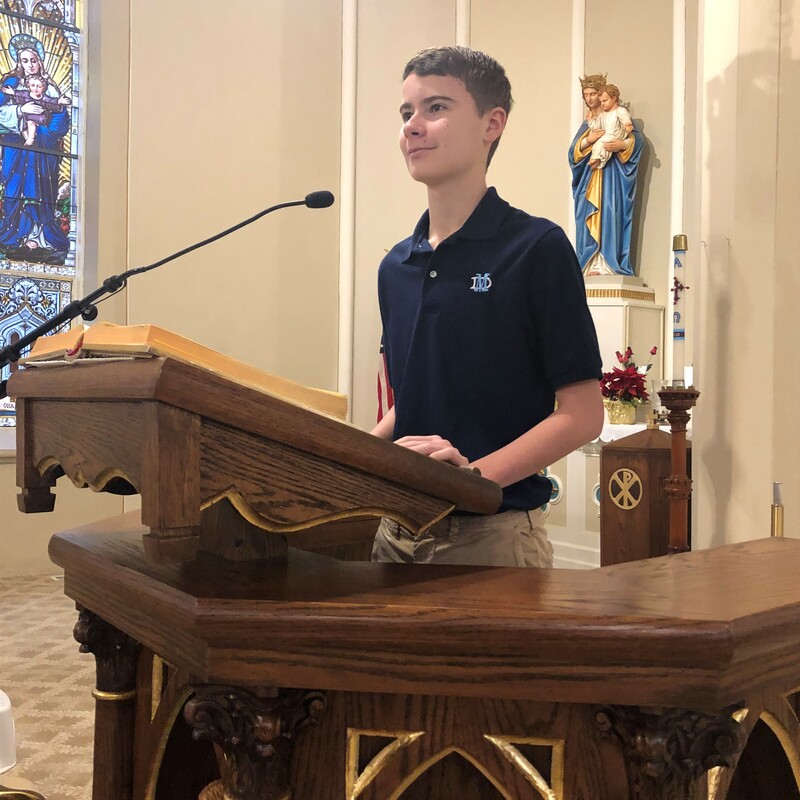 Freshman Sean Kuhl is pictured thanking his parish family at St. Dominic Catholic Church. 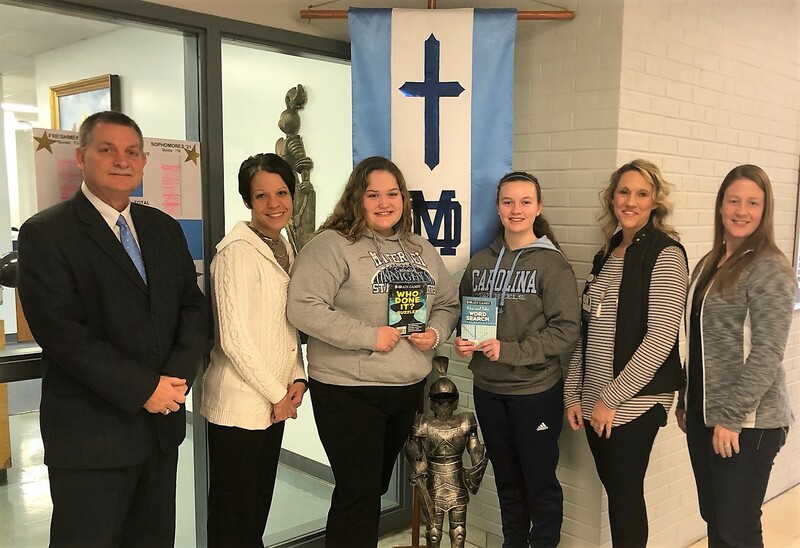 On our Catholic Schools Week Faith in our Community Day, (from left) Principal Dennis Litteken, Director of Enrollment Maria Zurliene, Abby Brandt, and Morgan Oertel are pictured donating activity books to St. Joseph’s Hospital Cancer Care Closet coordinators Maggie Timmermann and Megan Korte for Chemo Survival Kits. 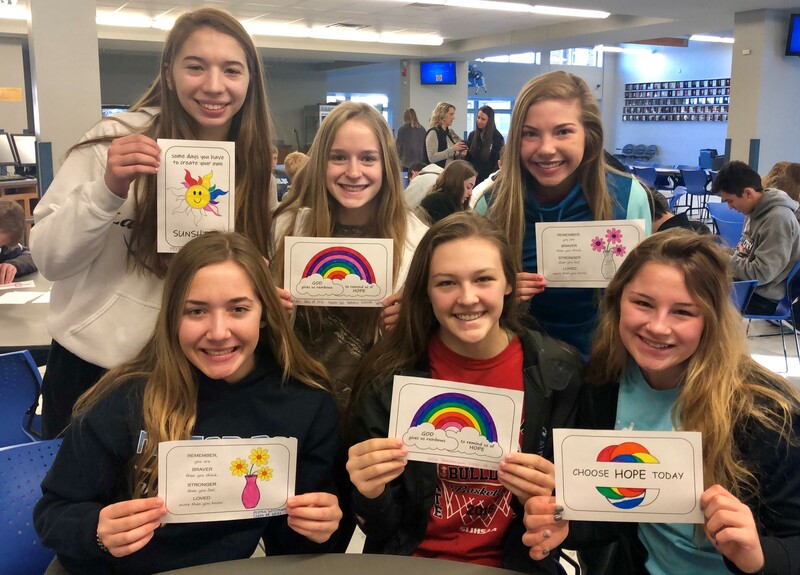 On our Catholic Schools Week Faith in our Community Day, sophomores (front, from left) Alyssa Willman, Jessie Timmermann, Audrey Lampe; (back, from left) Morgan Spears, Mariah Hemker, and Jaci Krebs are pictured while creating their cards of encouragement for the Chemo Survival Kits that will be distributed through the St. Joseph’s Hospital Cancer Care Closet. 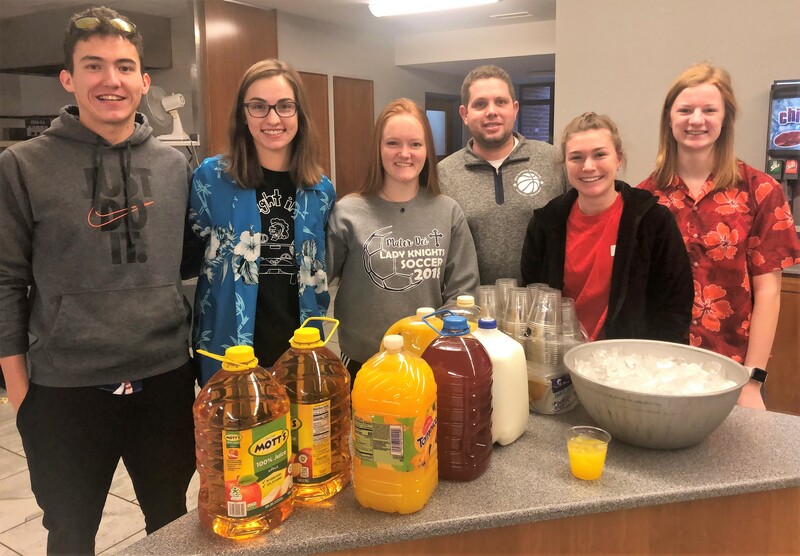 Mr. Travis Gebke (fourth from left) is pictured with Student Council members (from left) Nick Wolden, Maddie Sullivan, Carly Kampwerth, and Katie Toennies at the breakfast Student Council hosted for our Catholic Schools Week Administration, Faculty, and Staff Appreciation Day. 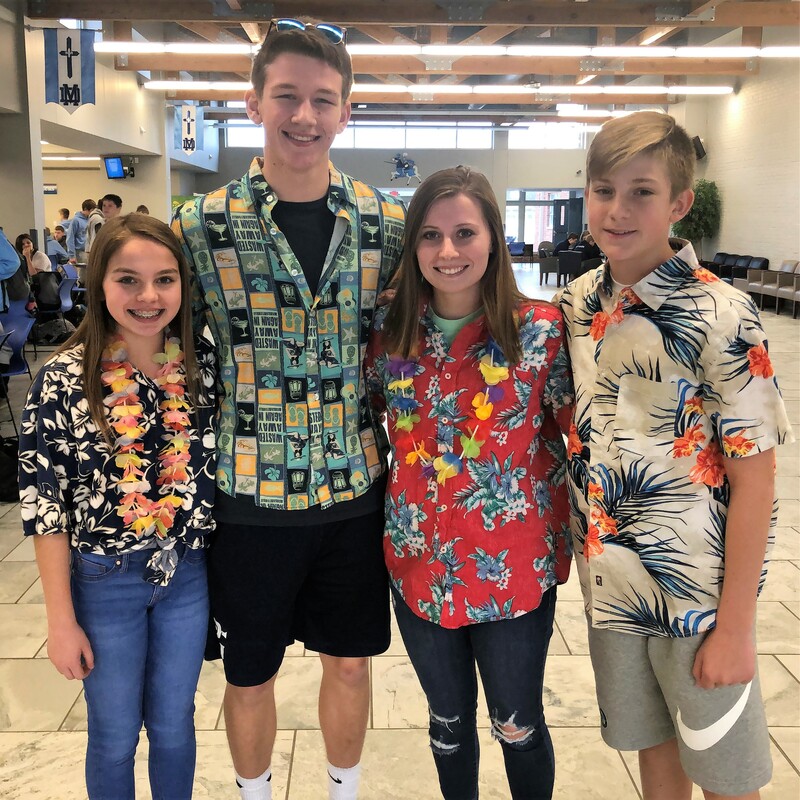 (from left) Maya VanDorn, Parker Johnson, Hayley Palm, and Quin Rackers are pictured enjoying our Catholic Schools Week Hawaiian Beach Day, which was held to celebrate that our faith guides us through the waves of life. Throughout the week, students also enjoyed Camouflage Day, to celebrate that we are soldiers of our faith who protect and serve those in need; Pajama Day, to celebrate that we are comfortable with our faith; and Mater Dei Spirit Day, to celebrate that Mater Dei Knights have a winning combination of learning, serving, leading, and succeeding.